Children’s Healthcare of Atlanta combines the rich histories of three legendary Atlanta institutions. For more than 100 years, Children’s has held steadfast to a single core mission: to make kids better today and healthier tomorrow. For 100 years we’ve been 100 percent dedicated to kids. 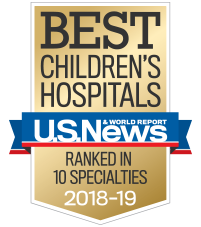 Founded in 1915 in two rented cottages with 20 patient beds, we are one of the only pediatric institutions in the nation that has existed for more than a century. From our focus on family support and treating the whole child, to our specialized equipment and techniques, we are tireless in our pursuit of providing the best possible care for children. Our rich history inspires us to head into our next century with an even stronger passion to ensure all children have access to the specialized care they need. We envision a future where all children have the care they need to keep them healthy so they never have to visit a hospital. 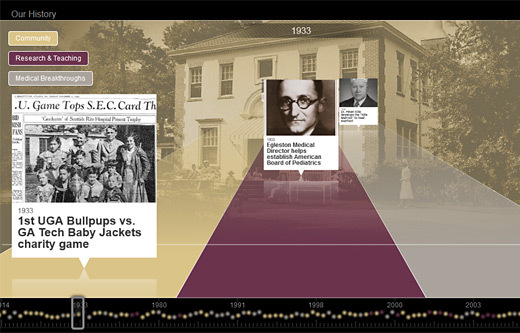 Visit our interactive timeline to learn more about our history and see the medical breakthroughs, research and community support that have helped us become one of the top pediatric hospitals in the nation. The first 100 years at Children’s Healthcare of Atlanta were highlighted by miraculous moments in time—from the founding of our hospitals and the tireless support of the community to medical breakthroughs and groundbreaking research. In 2015, we celebrated a century of caring for our community’s children. As we mark this milestone, we remember those who helped to make up our history, from physicians and patients to community leaders and volunteers. The story of Children’s Healthcare of Atlanta is one of hope, and of will—the hope for a better future for children and the will to make it happen. We invite you to watch “A Story of Hope and Will,” a documentary featuring the special people who shaped our history. See a three-minute sneak peek of the full documentary. See the entire thirty-minute documentary. In 1998, Egleston Children's Health Care System and Scottish Rite Medical Center came together to form Children's Healthcare of Atlanta—one of the largest pediatric systems in the country. The new system had a single priority: family-centered care. The next year, Hope and Will, our colorful boy and girl mascots, came to life as a way to represent the hopeful attitude and strong will of our patients, families and staff. In 2006, Children's assumed responsibility for the management of services at Hughes Spalding Children's Hospital, growing the system to three hospitals and 27 neighborhood locations. 1928 — Henrietta Egleston Hospital for Children opened. 1956 — Egleston became the pediatric teaching affiliate of Emory University School of Medicine. 1998 — Egleston Children's Health Care System and Scottish Rite Children's Medical Center officially merged to become Children's Healthcare of Atlanta. 1952 — The Hughes Spalding Pavilion officially opened as a private hospital for paying African-American adults. 1989 — Hughes Spalding temporarily shut its doors for renovation. The facilities reopened in 1992 as Hughes Spalding Children's Hospital. 2006 — Children’s assumed responsibility for the management of services at Hughes Spalding. 1915 — Scottish Rite Convalescent Home for Crippled Children opened. 1965 — Scottish Rite expanded into a full-fledged medical center.